KoreConX Minute Book Centrally Stores and Manages Company Documents. KoreConX Minute Book feature provides a safe, secure document repository that is easily accessible by approved users, audit trails and editing controls, ensuring accuracy and security while avoiding confusion. 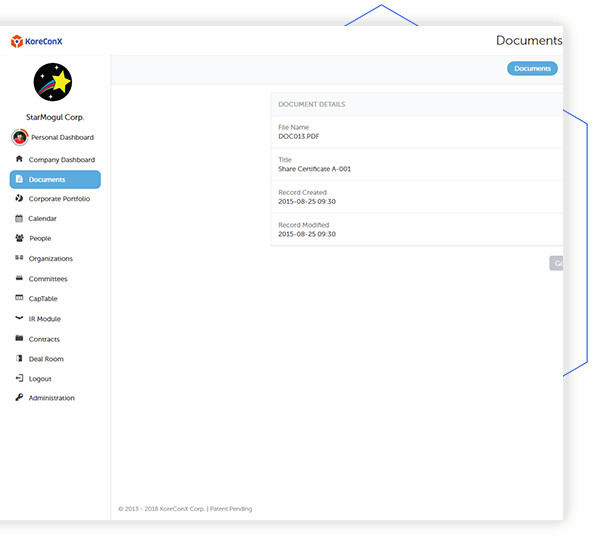 Minute Book Secures and Centralizes All Investment Related Documentation. All important company documents are accessible for business incorporation management and business document management through KoreConX Minute Book feature. In most financial transactions, companies are required to show proof that the company was “duly incorporated.” Having current records for all company actions make these types of processes less painful and less expensive. 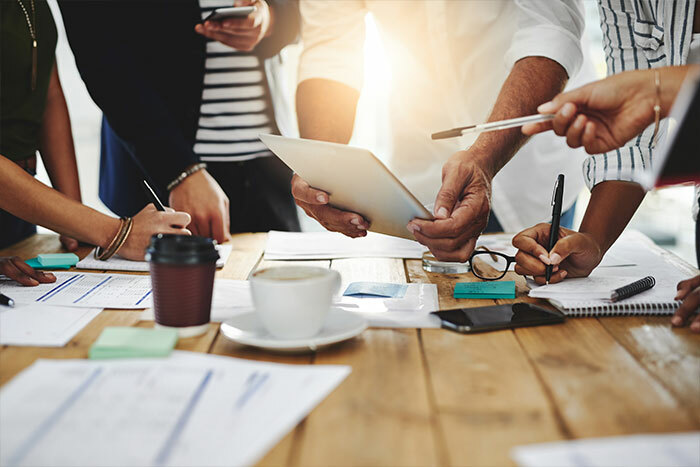 Access permissions are granted to pertinent parties, including stakeholders, lawyers and financial institutions, allowing for valuable collaboration and tracking, and avoids boards re-creating and ratifying all past actions. KoreConX permits legal and board members to edit or add material directly into the business documents, avoiding email distribution delays, security leaks and off-line version control. Real-time change tracking saves time and eliminates mistakes around version control. KoreConX Gives Insight to the Stakeholders That Matter Most. Investors, lawyers and accountants need access to up-to-date information when working on any financial related transaction. 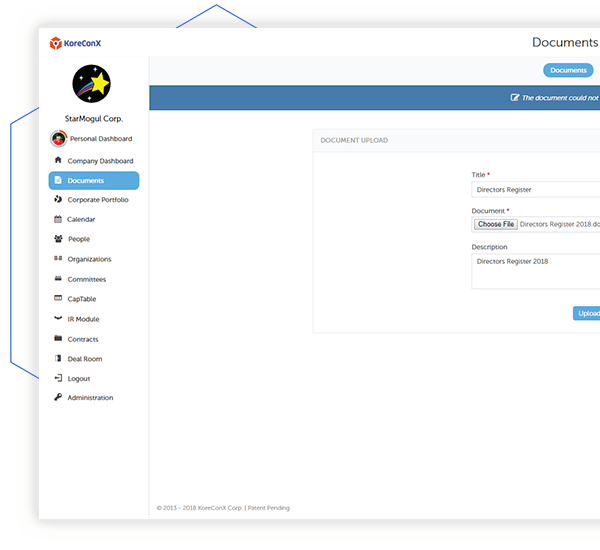 Make it simple and automatic by sharing critical documents securely to the correct stakeholders within the transaction. All groups will remain aligned and up-to-date on all critical documentation for maximum efficiency and compliance. "At WAFU we believe that companies with easy to access secure corporate documents, provide for better board and shareholder supervision and result in companies that are better and more transparently managed and consequently command better valuations, not just during a capital raise, but also, and most importantly, at the time of the M&A exit, this is why we use secure software like KoreConX, which provides us with this capability in a turn-key all-in-one easy-to-use secure solution." Get the full and simplified view of all your investments, organized in one central location. View company information (including board and management team), scheduled meetings, voting opportunities (electronic/e-voting), send and receive messages. Categorized by holding type (shares, options, warrants, debentures, etc. ), as well as designations such as public and private. Manage your capitalization table down to each transaction including the details and documents that are cross-linked to the individual security holder’s profiles. View the information in summary or by security type (shares, options, warrants, debentures, loans, promissory notes, SAFE/SAFT, etc.). Easily update data with the powerful bulk upload tool. Communicate with investors and potential investors directly using KoreConX Investor Relations feature. 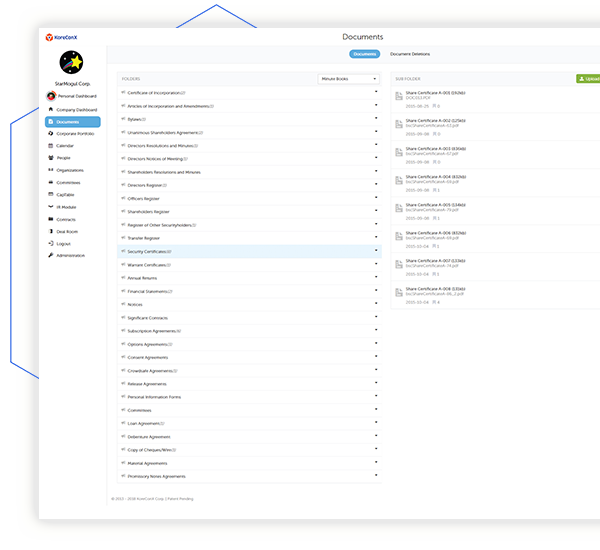 Track shareholder engagement with the ability to view downloads and confirm opened messages. Generate reports sent directly from the platform, complete regulatory filings, contract facilitation and more. Set up, organize and run shareholder meetings, create e-voting items and track responses.